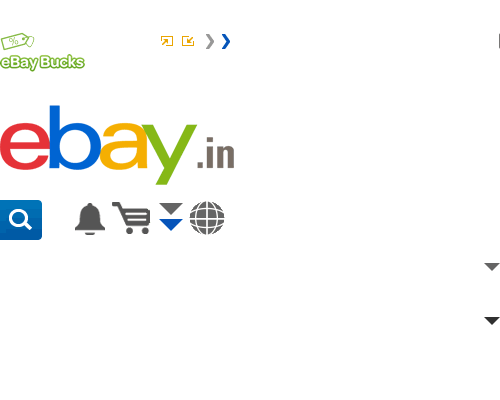 Art & Antiques, Handicrafts, Embroidered Home Furnishings & Ethnic Apparels and Jewellery are very popular categories on eBay India. Select the products that you want to sell on eBay. Consider the seasonality of the item and the quantities that work best for you. Check out the Jewellery and Watches under Hot selling products to get some ideas! You can also have a look at the Completed Items list on eBay. eBay offers you three types of Selling Formats. However, in Handicrafts, the Auction Format does very well. It is also beneficial to create shops for listing your products. Optimise space: Keep in mind that you only have 55 characters to use, so make intelligent use of space - bidders don't search for words like "wow", "cute", or "look". Describing the item extensively will avoid questions later. It is essential to anticipate a buyer's concerns and present the information in an easy-to-read format. Details about type of Art, its origin etc. Condition: Brand new, never used, used, slightly used, etc. Be very clear about your shipping, payment, and return policies. Although these are outlined in your listing, we recommend restating these in the description. See "Shipping & Sales Tax" section below for more information. Create a template to make listing easier. Creating a template prevents you from having to reinvent the wheel. You can also use eBay's Listing Designer to help you with the look and feel of your listings. You can boost sales by displaying a clear professional photograph of your item. Include 1-3 digital photos of your item from multiple angles. Any kind of digital camera will work. Take your photo in good light, shoot on a contrasting background, and at a slight angle for best results. Make sure your photo is not blurred. Highlight any important details such as imperfections, colour, and detail. Include photographs of any Certificates of Authenticity, etc. You can use various picture options such as supersize images, slide shows etc to give your listings a better look. I have excess inventory to liquidate. How can I sell it on eBay? There are three options to consider when deciding how to sell your excess inventory on eBay. Click here to compare the three options. Also consider listing large lots or bulk items in the wholesale category for Home, Tools & Appliances. You can also choose to sell in wholesale lots. Are all crafts sales on eBay 'auctions'? No, not always. When listing an item on eBay, you can offer your product at a fixed price or have buyers compete for the item and let the highest bid determine the final sales price. Know more about selling formats on eBay. However, handicrafts do very well in auctions as each buyer might attach a different value to the piece. Can I offer products in a Wholesale Format? Yes. eBay features a category for craft items called "Wholesale, Large Lots", where sellers can offer items in bulk lots. You can select “Wholesale” as a category while creating your listing. How do I collect payment from buyers on eBay? Sellers on eBay can determine their own conditions of sale and conduct their transactions on the site accordingly. You can choose to take cheques, money orders, credit cards, et cetera. Please note: it is important to include details on your accepted payment methods on each item you list on eBay, so that buyers can make an informed purchase decision. I am brand new to eBay. Is there a general overview of how to register, how to sell, and how to buy? Yes. Visit eBay Explained in the Help section for an introduction to eBay. You can also contact us through Live Help and get instant help for your doubts. What tools are available to list my items on eBay? eBay offers three Advanced Selling Tools to help high-volume sellers manage their eBay listings: Turbo Lister, Selling Manager, Selling Manager Pro, Picture Manager and Sales Reports. See a feature comparison of all three selling tools for more information. What is the best way to photograph crafts merchandise? Similar to a retail window display, a good photograph will clearly merchandise the item you are trying to sell. If you are selling crafts merchandise, it is recommended that you use a neutral background to highlight the shape and form of the product. Always include at least one picture in every listing you post. If the scale of the product is not clear, make sure to include measurements. Which measurements should I include for each crafts item? Depending on the item, include enough dimensional measurements so that buyers are crystal clear what they are buying. Use standard terminology so people understand the quantity and units of measure. What return policy should I offer? Offering a return policy provides security to a prospective customer, especially a new customer. While eBay does not require that you offer a return policy, having some sort of return privilege in place will improve bidder confidence and customer satisfaction. You should determine what yours is and include it clearly on every listing you post onto eBay. Who can I contact eBay if I have more questions? Check out eBay's Help section for answers to nearly all of our sellers' questions. If you still can't find what you're looking for, please use the "Contact Us" link in that section to submit your question to us. To get answers to your questions from fellow community members fast, try the Lifestyle Community Board found under the community section.